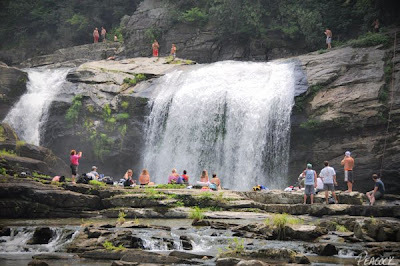 Twisting Falls (also known as Compression Falls or Twisted Falls) is found in the Elk Mills area of Carter County near the border with North Carolina. As you can see this waterfall is a popular place to be in the summer. It's listed as 30 feet high, but that seems to be a low estimate. Of course it made me nervous watching the young people climb the rope to the right and then either slide down or jump off the falls. 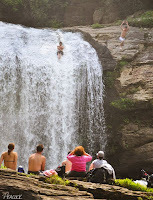 Above the main falls, they were also jumping into another large pool from a high perch above. Obviously all of this is very dangerous and not something I recommend... Back in June '09 a college student was injured there and it took rescuers five hours to bring her safely out. To be honest, I'm surprised (and very thankful) it doesn't happen more often. I doubt these young people consider how perilous a situation it would be for them and their rescuers if they were to injure themselves in such a remote setting. That said, this waterfall is stunning in its beauty -- open to the sun, with the falls large enough to send out a constant spray of mist, perfect on a hot summer day. But getting there is pretty tough. It's not a long hike (about 3/4 mile) but it is the steepest 'trail' I've seen in this area. The first part of the trail leads you through the woods to a clearing where there are overhead power lines. Hang a left, and you begin your descent. It's straight down. No switchbacks. Hiking poles or walking sticks may help. I can't imagine attempting to make it down the trail after a rain -- it was treacherous enough when dry. Do yourself a favor and wear descent hiking shoes -- I saw more than one idget wearing just flip flops. There was a rope halfway down that really helped -- although I'm not sure if it's always there or not. But take your time, watch your footing, and you'll reach the Elk River. At this point, you'll hear the falls from around the corner to your left. A trail will lead you over and around the slippery rocks until you reach the nearby falls. Enjoy the view and be careful! Click here for more information. Before venturing out, please read my warnings, safety tips and disclaimers. Check out Ben Sink's fantastic video of the falls! Directions: Take highway 19E to Hampton, TN and then turn north onto route 321/67 toward Mountain City. 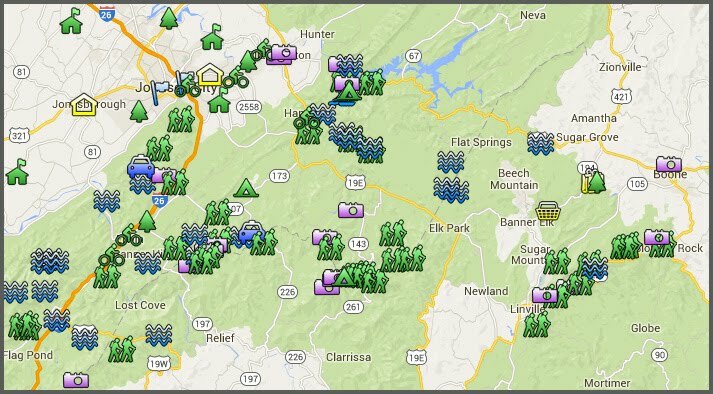 Drive 9.7 miles and turn right on route 321 which leads to Boone, NC. Drive 7.2 miles till you reach Elk Mills Store (which will be on your right), turn right after the store onto Poga Road. After 0.2 miles the road will split, keep left, cross Jack Campbell Bridge, and then you'll immediately turn right again to continue following Poga Road for 3.6 miles. Then turn right onto Clawson Road and drive 0.5 miles. You then turn right onto Dark Ridge Road and drive another 0.5 miles (it will eventually turn to gravel). You'll see an old barn up on the hill to your left, park on the road next to it (don't park next to the barn, that's private property). The trail head is across the road from the barn and marked with yellow and red paint on a tree. Map here. 8/14/10 Update: A 28 year old woman was severely injured when she fell 20 to 30 feet from the falls. It took the Carter County Rescue Squad four hours to rescue her and she was listed in critical condition with a broken back, a broken arm, a shattered heal and required eleven staples in the back of her head. (video of rescue here. more here). I certainly hope she will be okay. Earlier this week a 29 year old man nearly drowned. Incidents of injury and rescue are becoming so frequent the US Forest Service is set to address the problem. If you chose to visit this waterfall, be very careful and don't jeopardize your health, nor imperil the safety of those who would be called on to rescue you. Yes, these falls are beautiful and meant to be enjoyed -- but they should also be respected -- and so should those who work so hard and sacrifice so much to keep us safe. I accidently stumbled across your blog, and I have a feeling that I'll be checking back here often in the near future. I only wish that I had discovered it sooner, as I'm moving out to Oklahoma to go to school in less than a month. I'm currently living in Johnson City, so I assume that you live within close proximity to me. I don't have nearly as much time to spend hiking as I would like due to a busy work schedule, but your blog will certainly help to narrow down the list of destinations I would like to visit. Thank you for putting together this great resource. Take care. Hey Michael, Thanks for the note -- Glad you stumbled up my blog. If you haven't already, click on the map on the top right of the blog -- hopefully it will help you find some great destinations to explore. Do they also call this brown bottom beach? I haven't heard that one before -- but I suppose it's possible. Seems many of the destinations around here have multiple names. I occassionally will see this one listed as "Twisted Falls". During my days back home in the mountains, I have helped carry more than a few injured or deceased folks up that trail. Please use good judgment and decision-making when going to sites such as Twisted Falls, and make a conscious effort to be safe. Thanks very much for your note, Mike. Well said. I always hesitate to post directions to what I think are dangerous places. However, like you, I think this is such a beautiful place that it ought to be seen and appreciated...but only if visitors can do so safely. There is no parking area next to the barn. The land owner will have your vehicle towed if parked in his field. My roommate had broken his back here (from a pre-existing injury). I have never had a problem over the past few years. Safety is always rule one, but hiking down the river is just as great of an experience. I have been looking for these falls for sometime now and it is great that you have posted directions. We took a group of 20 people down to the falls this past weekend and I couldnt wait to get on this site and share our experience - as both a serious warning and advice about a beautiful place. First, make sure you have a GPS unit b/c it was very difficult to find with written directions. There is a grass field at the end of Dark Ridge Road that charges $5.00 per car for parking (honor system) and the money goes toward a local school, as I recall. It's really your only choice of parking unless you want to risk being towed to save 200 yards of walking. First, the hike down to the river is EXTREMELY severe - to say it is straight downhill is an understatement. We were blown away at how steep it was - consists primarily of loose dirt and rocks making it very hard to keep your balance. As someone else mentioned, going down this trail wearing anything besides hiking shoes is not recommended. Second, once you reach the bottom of the trail, dont get excited and lose focus on your footing - you still have another 200 yards over large, mostly wet/slippery rocks before reaching the base of the falls. The waterfalls are awesome, no doubt - we jumped several times and would have kept jumping if we were not running out of daylight. Because of the hike back, this would be one of the last places on earth that I'd want to be stranded after dark. My only advice in regards to jumping would be to be very careful how you land in the water - one of our jumpers leaned forward too far and hit the water face first. Appeared to have a mild concussion but will be okay, but could easily have been knocked out, etc. Alot of folks slide off the falls and this is probably safer b/c you'll usually land feet first. The hike down is dangerous, the hike back up is just flat out difficult - unless you're in very good physical condition. Be prepared to climb straight up hill on a 30% grade for approximately 250 yards. It's an awesome waterfall, but very difficult to get to and pretty dangerous from start to finish - BE CAREFUL. Special note to swimmers: do not attempt to swim underneath the top fall. it is possible to go behind the water and sit on a rock shelf, but the pool underneath has a washing machine effect and is more than capable of sucking a person down. a friend once tried this and was very lucky to leave with his life, a concussion, and a case of decompression sickness. Awesome place to visit!! Went a year ago with a group of friends and planning to go back in two weeks.The hike down is exactly as descibed above. Its very tough and back up is even worse but its worth the hike to see and jump off the falls. The slide was the best part in my opinion. Be careful and no your limits as theres no walking back up injured. There should be a camp site at the top of the hill where you park. this is not twisting falls, it is compression falls (named after guy compressed his spine trying to run it in a canoe). twisting falls is a spiraling death trap waterfall several rapids upstream with no good access and no enjoyability factor. Just be safe, it is 35 feet...land in the whitewater (via sliding off) for the softest landing as the curtain of the falls is breaking the surface plane of the water for you...note from an experienced whitewater kayaker. I have run this river and these falls and love this place. Be as safe as you can doing stupid and fun things and have a plan for when/if things turn bad. Can you in the surrounding woods? And if yes, do you need a permit? I went there yesterday to take some pictures. If you are there to do that I would reccomend going early morning. I was there Sunday at 1:30 and the Sun was directly in my path and could quite get the shot I was looking for. Either go in the morning or when you come off the path turn right and go down stream to find a place to cross the river. It's truly a majestic place to be but unless you're in top shape extremely hard to make it back out to the top. There are now 2 ropes to help pull yourself back up the hill. Take your time going back up and make sure you are hydrated when you go. when is the water warm enough so that you are not freezing? Can someone please tell me the actual address of the parking lot that is down the road a ways? The one that you have to pay $5.00 a car. The forest service has now made a parking lot at the trailhead. Went for the first time on Friday (8/24) and the new parking lot at the trailhead was very handy (free, easy access, can't miss). Beatiful falls. Had a wonderful time, and didn't attempt anything crazy. My whole family (wife, and 3 teenage kids) slid down the falls. The slide keeps you upright, and drops you into the whitewater, which doesn't hurt. Recommend that over jumping, for sure. This not compression falls either. Locals have always called it Big Falls. I don't like it when outsiders rename things to their liking. Thanks for visiting, Phil. I hate to disagree, but the area waterfall I most often heard referred to as "Big Falls" is Elk River Falls (in fact the topo maps label it as such). I've never read or heard of Compression/Twisting Falls being referred to as Big Falls. Great blog entry Mark! This is one of several waterfalls I have hiked to with your direction, including Jones Falls, Laurel Falls and the Blue Hole. I have seen articles saying that this one is Compression Falls and that Twisting Falls is just upstream, but I am still not certain. Big Falls is definitely the one in my home state of NC aka Elk River Falls. It sure would be nice to have a trail connecting these two, with access at both. It is ok to dream I guess. Thanks! Love the your blog and map!!! We used these directions to get to the falls, and had quite a trip. If you come down Dark Ridge road due to a GPS instead of following these to a tee, you will likely get lost (and proceed to spend an hour driving forwards and back trying to figure it out). When you reach the road that you think might be the right turn, do not be dissuaded by the fact that it is very narrow. It is the right choice and not just a driveway. If you still get confused, the very nice gentlemen at Elk Mills Store have copies of a hand-drawn map that is infinitely useful. It would seem that the old barn is now gone, but the parking lot is impossible to miss, because the road dead ends at it. There is now a red gate up preventing you from going any further. The red gate is marked with red and yellow posts. Do not pass it, climb up the big hill, come across 4 other groups who are all equally confused, all slide down a treacherous path that is WAY worse than the real one, and when you come to the bottom all decide the only choice is to start climbing along the side of the river. That is a mistake. You will all eventually get to the falls, covered in mud and blood after 2 hours of clinging to the sides of cliffs thinner than your shoes as the whole group inches along, falling down steep inclines where your imminent death is prevented only by one of your group mates and sheer luck as you all desperately hope that you don’t become Those Idiots that make the news because herd mentality lead to this disastrous decision. This is a good way to make friends, but a bad way to get to the falls. The right choice is to use the well-beaten path at the back of the parking lot that is very well marked and, after a seriously steep climb (that is not as harrowing as the other due to upkeep and frequent travel) you will come to the falls where you will have a good time and all stare at the large group that comes tumbling out of the woods covered in mud and blood. Thank you for the directions! I haven't been out in about 5 years, so my memory was a little fuzzy on which turns to take! Great post and information about the falls! The trail is extremely steep as others has said, but the sights and good times are well worth it if you can climb safely. A long ways back a few friends took me to this spot and it was great day until we got to the biggest Waterfall and a group of people were screaming at the Waterfall for their friend who had gotten pulled under by the hydraulic of the Waterfall. Long story short he didn't make it and it was days before they could recover him. Please let people know not to swim behind that last big Waterfall as it was one of the most shocking days of my life. This is a very dangerous place! A dear friend of my husband's died here just a few days ago while vacationing from Missouri with his wife and friends. He was only 25 years old...gone way too soon. PLEASE don't tempt fate. Too many people have been hurt or killed here.